Strong immune system allows our body to fight against diseases. Unfortunately, from time to time, our immune system loses its natural ability to fight infections and we get sick. To reduce the risk of getting sick, the immune system must work in a certain way. Herbal medicine may help to enhance the activity of immune cells. 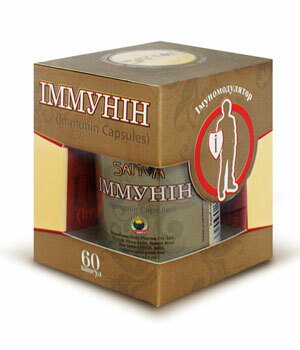 Sattva Immunin Capsules is herbal supplement, which contains the most effective natural immunomodulators. Strong immune system is essential for health. It is a very complex system of the body, which includes skin, intestine, nasal mucosa, blood, lymph and other organs and tissues. Such factors as lack of nutrients, environmental pollution, unhealthy food and lifestyle as well as exposure to harmful microbes may weaken the immune system. Other factors that weaken the immune system are negative attitude and emotions, the presence of toxic metals and toxic chemicals, and biological toxins in the body. Slow metabolism, lack of sleep and rest, excessive stress and large physical load affect the immune system in a negative way. The path towards a strong immune system, health and ability to fight infection is very simple. Ayurvedic supplement Sattva Immunin capsules provides effective aid to the body in strengthening the immune system. Reduces the risk of getting flu or other viral infections. Helps to achieve optimal functioning of the immune system in fight the disease. Helps to speed up the recovery. Aids to restore health after illness. Prevents premature degeneration of cells. Increases the energy and vitality. The immune system consists of a network of special cells, organs and tissues that protect the body from germs invasion. Unfortunately, the human body is a perfect environment for germs. The immune system recognizes the "foreign invaders" and sends a command to the special cells of the immune system to target and destroy the foreign agents without harming healthy cells of the body. Antigen is the substance which induces an immune response. Germs and viruses are common antigens. The immune response can be triggered by the tissues transplanted from another person's body. Even harmless, at first glance, substances, such as pollen, may provoke an immune response known as an allergy. Abnormal immune response may cause changes in certain body tissues, leading to autoimmune diseases. Lymphoid organs located throughout the body are containing blood cells known as lymphocytes. Lymphocytes are produced by the bone marrow. Lymphocytes, known as T-lymphocytes or T-cells, are cells of the immune system responsible for the destruction of foreign agents inside the body. Antibodies, which help to prevent infection, produce B-lymphocytes or B-cells. While the B-cell targeted towards specific antigens, T-cells directly attack the infected or malignant cells. Well-coordinated immune response is provided by T-cells in interaction with immune cells. Immune cells secrete proteins, known as cytokines, which act as chemical mediators and provide the normal functioning of the immune system. Apart from T-cells and B-cells, a large number of white blood cells known as phagocytes, eliminate old, worn-out cells and foreign particles from the body. Granulocytes such as neutrophils, eosinophils and basophils are immune cells that contain chemicals to kill germs. Mast cells (mastocytes and labrocytes) are other types of immune cells present in human airways and the intestines. Lymphocytes encounter in combat with antigens in the lymph nodes. The spleen is another famous organ where immune cells fight against antigens. A weak immune system does not only increase the risk of infections, but can also lead to fatal diseases, such as cancer. Cancer cells start to grow and multiply when the immune system is breached. Sattva Immunin capsules contain plants that are strong immunomodulators such as Guduchi, Ashwagandha and Haridra. These plants help to improve the proper function of immune system cells and have been used by Ayurveda practitioners for hundreds of years. Guduchi - Tinospora cordifolia (Tinospora cordifolia) is a plant with strong energy. Guduchi means "Giving life" and literally could restore life. It nourishes the body on all levels. In addition, this plant deeply and effectively cleanses the body of toxins produced by pathogenic microorganisms and purifies the blood of ama (products of incomplete metabolism). Guduchi is a powerful antioxidant. This component of Ayurvedic formulations may help to enhance the immune system and change the human response to stress. Guduchi has a detoxifying effect. Provides vitality and energy of youth. Helps to alleviate the effects of stress, brings physical and mental balance. Guduchi is a powerful Rasayana (body rejuvenator). It increases the quality and quantity of Ojas (vital energy). Guduchi helps to strengthen the immune system, increases the production of lymphocytes such as T-cells and B-cells, and promotes macrophage activity. Modulates the activity of pro-inflammatory cytokines, preventing overproduction. Guduchi may be helpful for HIV-infected patients. In clinical trials researchers have found that almost 60% of HIV-positive patients had a significant reduction of symptoms of the disease after receiving the Guduchi extract for six months. Guduchi has a relaxing, diuretic and diaphoretic action. Strengthens body tissues and heart, balances all body systems and relieves many diseases. Guduchi has amazing properties. The plant is so strong and full of life that it can grow even without soil and water. If you cut and hang Guduchi plant close to the soil but not touching it, its leaves and branches will still be growing as if it would be planted in the soil and watered. Guduchi plant is full of life. Ashwagandha (Withania Somnifera). Translating from Sanskrit “Ashwagandha” means “Horse power”. It increases the body's resistance to infections and improves digestion. It is a tonic and antistress remedy. It relieves chronic fatigue and tissue oxidation, as well as prevents premature menopause. The main benefit of Ashwagandha is its calming still toning effect to the nervous system. Ashwagandha restores the basic energy of the nervous system and its effect persists for a long time. It is one of the best rejuvenating plants that can be used by older people, children, those, who is weakened by chronic diseases and stress. The biological activity of Ashwagandha is associated with a high content of fitosterols, lignans, flavanoid glycosides, and steroidal lactones. The last ones have the strongest effect. Ashwagandha is traditionally used as a sedative, diuretic, rejuvenator, tonic, anti-inflammatory remedy and as an adaptogen. Many Western herbalists refer to this plant as a "Ginseng of Ayurveda” because of its ability to increase energy, strength and stamina, as well as to relieve stress. Ashwagandha has anti-inflammatory and immune stimulating properties. Various chemical constituyents of the plant showed a number of therapeutic effects. One of the reasons for Ashwagandha’s reputation as a tonic is the effect over the immune system. Numerous studies on Ashwagandha usage have shown a significant increase of white blood cells and other factors to boost the immune system. The immunostimulatory activity of Ashwagandha has been demonstrated in a number of experimental studies. Ashwagandha root extract helps to enhance the immune system. Ashwagandha helps to stimulate the production of lymphocytes and bone marrow cells, which ensure adequate immune response. It enhances the activity of T-cells to fight what provoked the disease. In addition, Ashwagandha enhances the activity of macrophages in the spleen. It is beneficial for people suffering from chronic infectious diseases. Immunostimulatory action of this plant helps to inhibit the growth of cancerous tumors. Haridra – Turmeric (Curcuma longa) is an aromatic herb of the ginger family native to Southeast India. Turmeric produces an amazing healing effect to the human body. It is included in most Ayurvedic formulations. Its spicy and bitter taste provides a warming effect. It is used as an anthelmintic agent, suppresses putrefactive intestinal microflora, removes the excess of intestinal mucus, and normalizes the gastrointestinal tract function. Regulates the blood cholesterol, promotes the bile flow, improves pancreas. It is a potent anti-inflammatory and antiseptic remedy. Improves blood circulation, promotes formation of erythrocytes and decreases the platelets. Regulates the metabolism and stimulates the immune system. Turmeric is a wonderful natural antibiotic that restores the intestinal flora and simultaneously improves the digestion. Turmeric root is a very potent antioxidant. Contains phosphorus, iron, calcium, vitamin C and B, essential oils, terpenes and a yellow pigment known as curcumin. Recently, Indian scientists have confirmed that curcumin has immunomodulatory properties, which makes it an effective remedy to treat cancer and Alzheimer's disease. For best results, take Sattva Immunin capsules together with Sattva Amalaki Rasayana capsules or with Sattva Chyawanprash Special. Avoid heavy, fat, fried and spicy foods. Give preference to whole grains, such as wheat, millet, and brown rice. Consume plenty of fresh seasonal fruits and vegetables. It is recommended to practice yoga and breathing exercises (Pranayama). The extracts of Guduchi (Tinospora Cordifolia), Ashwagandha (Withania Somnifera), Turmeric (Curcuma longa). Take 1-2 capsules 2 times per day 15 -20 minutes after meal, preferably with a glass of warm water. Weakened immunity, frequent respiratory infections, and chronic fatigue.